Hi there, I’m happy to see you here on my site, stroller reviewed, welcome to my about page! My given name is Michelle, but most of my friends call me Shelly. I am a wife and a mother of 1 child. My daughter is now 4 years old and I love her very much (of course!). When our daughter was born a whole new world opened up. There are so many baby products that it’s almost incomprehensible. Luckily you don’t need that much, but you need a few essential things, such as a baby stroller and a car seat. If you are lucky you can borrow these things from your friends, family or neighbors. Did you know that today the average parents spend about $10,000 on their beloved baby (that’s just in the first year!). Since I love my daughter and I love shopping I spend a little more, after doing the math I discovered that I had spend close to $20,000. Well, that’s a bit too much, what do you think? On this site I would like to communicative what I have found out about the products that I have purchased over the last couple of years. 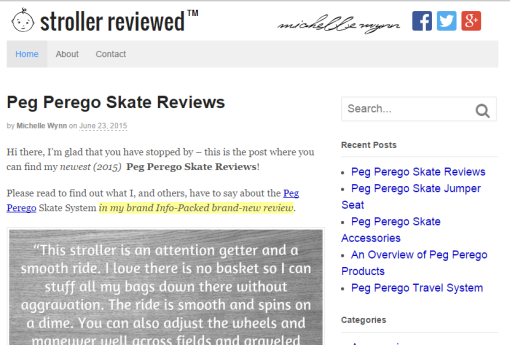 I believe that consumers should help each other with product recommendations, reviews and suggestions. It’s important that our children get high quality products and that the bad manufactures are weeded out. Don’t you think? My site is about products that I have the opportunity to do extensive research on. Some of the product I have personally used, and others no so much. Instead they have been recommended to me by friends and family. I created this site to be a placed dedicated to baby stroller. I site that parents, you, can trust, and I place where we can share our experiences and ask questions. In the process of building this site I have discovered that I like writing about these things. I hope that you enjoy my little corner in the cyberspace just as much as I enjoyed creating it! If you’d like to reach out to me, you can find my contact information right here.